Innovation and technology are usually the driving force behind new tile trends. It is certain that the market has exploded with limitless product lines in all different shapes, sizes, looks and surfaces finishes. And while consumers like the qualities such as sustainability and durability that tile can offer, they might still feel that as a flooring material it is too cold to use throughout their entire living space. To solve this problem, more companies are offering electric radiant floor heating systems to provide the benefits of tile with the comfort of warmth. Ken Barnum, Product Manager at Laticrete International in Bethany, CT, agrees that electric radiant floor heating systems are rising in popularity. “Electric radiant heat started to become popular among homeowners between 2001 and 2005,” he said. “This was a period of significant new residential construction and remodeling, and strong floor warming sales carried into the early years of the U.S. economic downturn. With time, awareness has grown substantially in the last decade and an interesting segment of the market has made a significant impact, the do-it-yourself customer. The product offering from most major manufacturers has evolved to focus on ease of installation in an effort to make this product more common. Andrew Acker of Schluter-Systems also believes that the real benefit of electric radiant floor heating is that it makes tile comfortable to walk on. “It warms the floor,” he said. “Customers’ number one complaint is that tile is cold. They love that it is durable, a green material, and easy maintenance and care. According to Barnum, the technology of the actual heating element has not changed much. 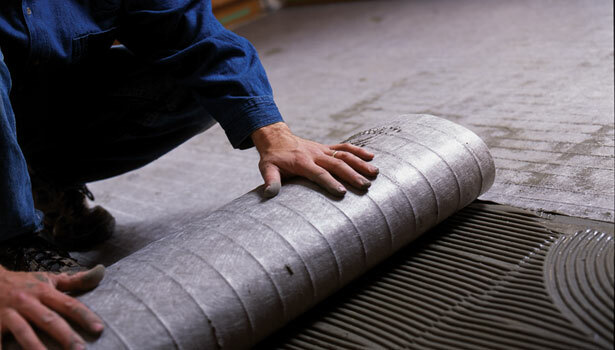 “There have been a few attempts by companies with ‘newer’ technologies to break into the market, but the majority of electric floor warming being installed is either a mat system or loose wire system,” he said. And when asked if there are any specific details that installers should know before installing comfort warm heating systems, Barnum states that they should follow the basic rules of installation.